Catholic Conspiracies II: Revenge of the Vatican Ninjas. Last week, I mentioned that the vast, massive conspiracy theories about the Catholic Church amuse me. I discussed some specific issues and theories, but I find them all funny, almost no matter the details. Why? Dear God in Heaven, where do I start? The theories are so ludicrous, I hardly know where to begin. One running theme of most of the conspiracy theories is that there is a “conspiracy of silence” running around within the Vatican, the hierarchy, an order, pick one or all. This pops up in almost any fiction where a Catholic priest appears. Given the news of the last decade, anyone should see an immediate problem. Not only does the Church of Rome write everything down, they never throw anything out. This is a bureaucracy that has held onto the divorce petition from Henry VIII of England, written in the early 16th century. We've held onto it for nearly five hundred years, and we haven't thrown it out yet. If there were a conspiracy in the church, there will likely be paperwork to document it, and they'd hold onto it with their dying breath. Bad habit for a conspiracy. But, the way I look at it, the Vatican is essentially the world's biggest marble office building, complete with Dilberts and the occasional pointy-haired boss … or pointy-hatted boss. In the current day and age, any bureaucracy can keep a secret for a few years. But two thousand? Really? Catholic Conspiracies: The Illuminati Polka and the attack of the Vatican Ninjas. I have decided to make this a comedy posting. Why? Recently, I went looking for a book on one end of the crazy spectrum. The book had been (loosely) based on an episode during World War II, and it was supposed to “prove” that Pope Pius XII could not qualify as “Hitler's Pope.” Instead, this conspiracy theory had Pope Pius XII using the Jesuits to assassinate Adolf Hitler in World War II. It was called Vatican Assassins. On the one hand, it really covered an actual incident during the war: where German Generals who wanted to kill Hitler had expressed a desire to use Pius XII as an intermediary. The Generals thought that Pius XII could be a neutral party when talking to the British, laying the groundwork for a truce after they had assassinated Hitler. Obviously, the plan didn't work, since Hitler killed himself years later. On the other hand ... Vatican Ninjas? Are we serious? As for Vatican Assassins, I had originally stumbled across this work six years ago, when I first researched the entire matter of “Hitler's Pope” for a graduate paper. This was a few months before I even started writing A Pius Man. Perhaps an entire year before the book. Recently, I wanted a laugh, and I wanted to see if anything had happened with this particular nutjob and his Vatican Ninjas. Rules for Antagonists, Villains, etc. A long while ago, a writer came up with a contest for Rules for Superheroes. It was cute, and genre-specific. But I always like a smart enemy to go with my protagonists. Preferably, someone who thinks ahead. So, I have Rules for Antagonists. Be they killers in murder mysteries, archvillains in comic books, or your basic takeover the world types in science fiction and fantasy, this should be their playbook. Rule #1: NEVER. TOUCH. THE GIRLFRIEND. It only pisses them off. Drazen's Corollary: While abducting the significant other / close relation of your archrival in order to lure him/her into your sinister trap, it will only serve to piss them off. Your normally docile hero, who tends towards nonlethal force, will seriously consider thrashing you to within an inch of your life, and--if no sidekicks are there to enforce restraint--might go three inches beyond that. Parker's Corollary on Drazen: If you MUST lure them anywhere, use the standard busload of children chosen at random--it will typically serve to get the required effect, especially with a note to the local media sources and/or police agencies. Should you do this in a city with a high protagonist population (eg: Marvel's New York), be certain to request the hero of your choice: otherwise you get all of them. Fletcher's Corollary: Overlook no one. Seriously, if you're going to take over the world / kill someone / unleash a diabolical scheme, no one is unimportant. Witnesses will provide evidence. Just because it's some nobody in the background asking questions doesn't mean there's no threat—people in the background tend to observe a lot. Goldfinger's Corollary: Never use the line, "Because you are all about to die anyway, I will tell you all about my evil plan." This includes all variations on this theme. Rule #3: Avoid patterns. No matter how comfortable you are with a certain places / style / or MO, repeating it on a constant loop will only serve to have the authorities find you. Rule #4: Wear gloves during your crimes. If possible, wear a full body suit to prevent fingerprints, hairs, or skin cells from being left behind. Grissom's Corollary For Killers: This includes keeping souvenirs. Rule #5: Don't let ideology govern your tactics. Just because your ideology says that your enemy is inferior doesn't make them stupid. Tarkin's Corollary. Underestimating your enemies will get you killed. Thrawn's Corollary on Tarkin: Underestimating your allies will also get you killed. Rule #6: Suicide bombers have never won a war, or even a battle. It only wastes experienced soldiers. Even disposable foot soldiers are not infinite. Minions do not grow on trees. Zahn's Corollary: Unless you have a cloning unit for disposable foot-soldiers. Von Doom's (PhD) Corollary on Zahn: Or you build your own. Rule #7 (or Rule 2, Expanded): If you have a chance to remove the adversary from the playing field on a permanent basis, do so. Do not lecture them, explain your scheme, or toy with them. Shoot them in the head, and move on. Stark's Corollary: Also, do not wound them so they can still be useful to you. If they can be useful to you, they can also hurt you. Ming's Corollary on Stark: Your enemy can be useful to you – dead. Examples are usually better that way. Rule #8: If you cannot see the hero, worry. Murphy's Corollary: If you cannot see your adversary, s/he is behind you. Rule #9: No self destruct mechanisms, unless they are password protected, and require the passwords of at least three of your closest allies. And confirmed by you. Twice. Rule #10: Plan ahead. You have all the time in the world to unleash your deadly plot on the world, or execute your crime. Take appropriate precautions, and don't assume that everything will go according to plan. If your plan is perfect, you're missing something. Murphy is always right. Palpatine's Corollary: If you are going to invite your enemies to come into range of your ultimate weapon, make sure that it's finished first. Rule #11: No time travel. You don't have enough aspirin in the world to deal with the headache it will cause. Doctor's Corollary: Unless you have a blue box. Rule #12: Whatever psychological problems you have, make sure that you utilize them well. Wilson's Corollary: Don't suffer from madness. Enjoy every minute of it. Rule #13: When your adversary is incapacitated, on the floor, at your mercy, it is not the time to (a) exercise your creativity in designing Rube Goldberg-esque death traps (b) write your monologue or (c) start gloating. The answer is (d) shoot them in the head and move on. The Spanish Steps, A Pius Man, and why do I blow up public places? The new, better graphic provided by Matt. 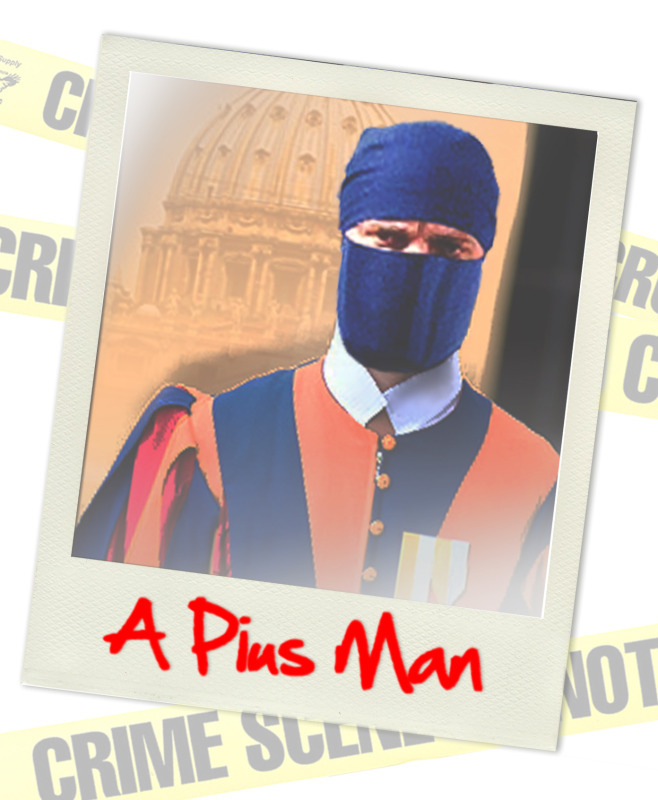 Many people who have visited my pages for A Pius Man may have noticed an odd photo. It has an image of an armored SUV driving down the Spanish Steps, in Rome. Why do I have it there, and what does it have to do with A Pius Man? Not to belabor the obvious, but the latter question is easy to answer: a scene in my novel has the Knight-XV Fully Armored Vehicle going down said historic landmark.